Each quarter SWPP surveys the workforce planning community on critical workforce planning topics. Over 170 call center professionals representing a wide variety of industries participated and provided insight into this quarter’s survey on workforce management staff. 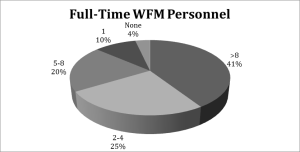 Over 40% of the respondents indicate that they employ more than 8 full-time personnel in their WFM operations. Given the 45% who report having over 500 agents, this correlates as expected. 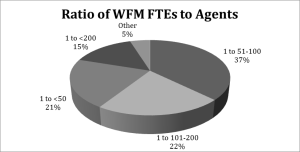 At the other end of the scale, with 7% of the respondents reporting under 50 agents, there are only 4% of the centers indicating no full-time WFM staff but a surprising 10% who have only one full-time person. 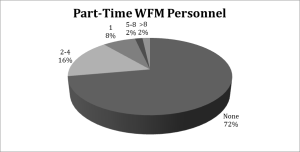 Nearly three-quarters (72%) of the respondents indicate that they have no part-time WFM Personnel. Only 2% indicate they have more than eight part-time people. For those who do use part-time staff, the bulk employ only one (8%) or between two and four (15%). Some centers find that utilizing part-time staff in WFM gives them some flexibility to adjust for vacations, absences and attrition. In addition it can serve as an apprenticeship for someone who wants to consider a WFM role. factor is the complexity of the environment and how volatile the workload variations are. A relatively stable environment with traditional routing can often achieve success with fewer people in WFM than a highly volatile environment with skill-based routing enabled. Nearly half of the respondents (46%) indicate that none or under 10% of their staff held WFM roles in other departments or companies before being employed in the current WFM role. Over 20% report that over 75% of their staff have held such roles previously while another 15% report that between a quarter and half of their staff have. This suggests that experience in the WFM role is a significant hiring criteria for many contact center WFM departments. 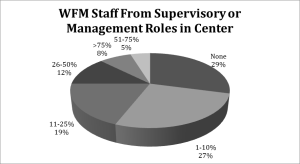 Over half of the respondents indicated that none or less than 10% of the WFM staff held supervisory or management roles in the center before moving to WFM. 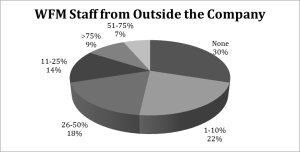 However, another 13% total reported more than half come from these positions. While large WFM departments have a need for supervisory and management roles within the department, smaller ones may not have such opportunities. Recruiting people who have personnel management experience and teaching them WFM seems to be working for some centers. 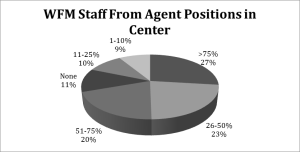 When asked what percentage of the current WFM staff held agent positions in the center before moving to WFM, 27% report that more than three-quarters were agents. Another 23% report that between one-quarter and half were agents and another 20% report between half and three-quarters. But there is still 30% that have fewer than 25% coming from the agent position. Almost one-third (30%) of respondents hire no staff for WFM from outside of the company but 16% report that more than half come from outside hires. While WFM can be both a promotional opportunity and a lateral move in some centers, there is definitely movement within the industry from one company to another. Sometimes this is a WFM person in a smaller operation looking for the experience of working in a larger, more complex environment. Or it can be someone who is performing a narrow role in a large center wanting to have a broader role in a smaller operation. In any case, the opportunities both within companies and between them seem to be open for WFM experts. When responding to the question about the average tenure of the current WFM staff, some chose to report all staff together and others broke the numbers out by role. Over half of the staff total and those in the roles of Forecaster, Scheduler, and Other roles have more than four years of service. Those in the role of Realtime Analyst tend to have shorter tenures but this is largely due to this role being the entry level in many WFM departments. 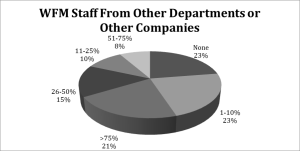 Many of these staff will move into the other positions over time. WFM is not an easy job and one that takes some time to master so it is good that the tenure in the positions supports this development. 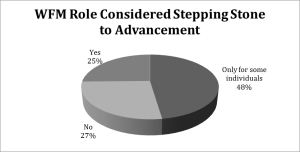 Almost half of the respondents consider the WFM role a stepping stone to advancement only for some individuals (48%). The rest are pretty evenly split between agreeing that it is or saying that it is not a stepping stone. Some may have interpreted this question as meaning advancement within the department and others only to roles outside of the department, but both are possibilities for the WFM staff who prove their capabilities. Some report movement into Operations roles such as Team Leader, Supervisor, or Operations/Call Center Manager. Others indicate movement into higher levels of responsibility within WFM, while still others report movement to specialized roles such as Project Manager and unique roles in their business. One of the requirements of great WFM personnel is a solid knowledge of the business their center serves, so this is a valuable commodity in many areas of most organizations. Based on the responses above, it appears that the WFM role remains a “key discipline” in contact centers. It is a role that can be filled from a variety of sources including agents, supervisors/management within the center, and from other departments within the company and outside of the company as well. The complexity of the WFM role requires experience to achieve success and the average tenures reported suggest that many organizations are keeping their WFM people for several years. The WFM roles can also be a good stepping stone for individuals who are looking for advancement both within the department and beyond. We appreciate your participation in this study and hope that you will participate in our Summer Survey.